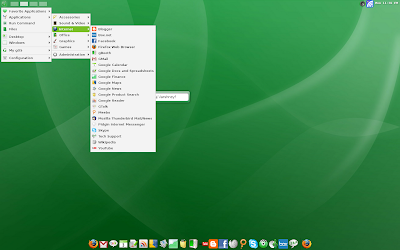 I have been using Linux for close to a decade now.Even though there has been a tremendous growth in the desktop Linux with maturing of the KDE and Gnome Desktop and availability of a number of really good desktop Linux application over these years. Somehow most of the Linux distributions have felt very similar and well there hasn't been anything radically different about them (Though there has been few exceptions like RedHat and it's Bluecurve , Novell Desktop , Lindows , Xandros , Symphony OS , Ubuntu(Extremely Simple and Free CD's :) ) etc though most of these distro's never gained enough momentum (Ubuntu is an Exception though) ) . 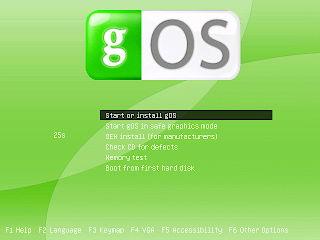 gOS is one such Linux distribution( developed by "Good OS LLC', a Los Angeles-based corporation" ) that has been attracting a lot of attention lately because of it's intergration of Web based applications (Particularly Google ones which made many people to interpret it as Google OS) with Linux desktop . Having read so much about gOS like operating system's being the future of OS and stuff i decided to give gOS a try and here is my review . After burning the ISO as soon as you boot from the CD your are greeted with a green colored screen showing you various options for booting the CD. gOS is a Linux distribution that is based on popular Ubuntu distribution and hence entire Ubuntu repositories are available with gOS providing a rich set of applications to gOS desktop . However unlike Ubuntu gOS uses lightweight Enlightenment as it's default window manager . Once the entire enlightenment desktop is loaded, one of the first thing you notice is the attractive iBar at the bottom with links to number of web based applications . Clicking anyone of the icon loads Firefox with the associated web application loaded. Also as you hover your mouse over the icons the icons enlarge and reduce very similar in fashion to the dock at the bottom of the Mac OS . Also one can easily add or remove applications from iBar by going to (My Settings -> Applications -> iBar ) . In the iBar you will find a Q&A icon too , which basically takes you to gOS help site. Though the site is not very useful which might be attributed to lack of users actually using gOS, though situation might improve later as more and more users join gOS bandwagon . 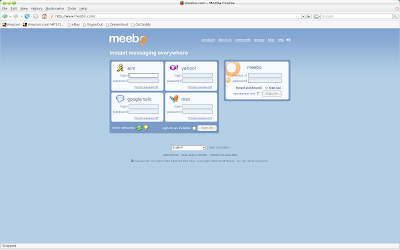 Clicking on the IM button takes you to meebo site which allows you to chat on a number of different protocols including Google, AIM , Yahoo etc . There are traditional Trash (aka Recycle Bin ) , My gOS(aka My Computer for Windows users ) icon on the desktop besides icon for installation of gOS on hard disk(if u r booting from Live CD that is ) . Also at the center of the desktop there is a Google Search text-box that allows you to search anything quickly . Typing anything in the text-box opens up Mozilla Firefox with google search for your typed query. 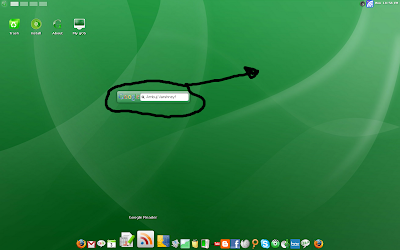 There is a small Green Coloured icon at the top left corner of the screen clicking on which opens menu which houses all the applications and menus for setting and all kind of stuff . 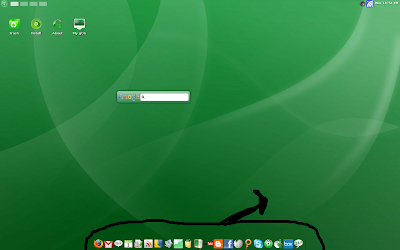 To the right of the green icons are the active workspaces , clicking on anyone of them takes you to different workspace . gOS also comes installed with 'Google Gears' which is a software Google is developing which would allow google applications to work off line that is without needing internet connection . Right now the only application that works off line is Google Reader . So on gOS you should be able to download your feeds in Google Reader and read it later offline without being connected to internet. There are number of other interesting applications and more can be easily installed from ubuntu repositories by using synaptic package manager . Because of reliance on so many online applications gOS should work pretty flawlessly on even modest of modest configuration of hardware and using lightweight window manager enlightment just helps the cause. Conclusion : gOS is an extremely usable and user friendly Linux distribution. It actually brings much needed breath of fresh air to stagnant desktop Linux market (Dominated by Ubuntu and other distribution which are pretty similar with nothing radically different) . The future of operating system is certainly taking things online making operating system more of an interface to the applications available online and gOS takes a small step forward in this direction by integrating all kind of online applications into the gOS desktop and making the interface extremely user friendly.Also selling computers preloaded with gOS in Wallmart is another step in right direction . Overall gOS is highly impressive Desktop Linux distribution and one distribution to look forward to making in future.